While we were in Michigan over Thanksgiving we stopped at our favorite Middle Eastern restaurant in Ann Arbor, Jerusalem Garden, for a tasty mjadra sandwich. Mjadra is basically just lentils, caramelized onions, and either rice or bulgar. I haven’t been able to find it at restaurants in Colorado, so I decided to try to make it myself. I found quite a few recipes online, some with rice, and some with bulgar. Some had almost no spices, and some had many. I decided to use a cup each of brown lentils and brown rice, 2 large onions, a little cinnamon and some cumin. I also added about a half cup of bulgar at the end to soak up the remaining water. It was pretty good, though I think next time I will cook it a little longer, use less cinnamon, and add garlic. 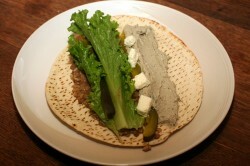 I put the mjadra in a pita, along with some baba ghanoush, lettuce, a pickle, feta cheese crumbles, and a little Red Hot. This entry was posted in cooking and tagged baba ghanoush, bulgar, lentils, middle-eastern, pita, rice. Bookmark the permalink.